In this guide we will focus on the sending options in the form system, settings, spam filter and integration with external plugins. In this field you can set the email to which every new feedback will be sent from the form. The default is set as the admin's email, but of course you can change it to the relevant address or even insert a few emails by separating them with commas. 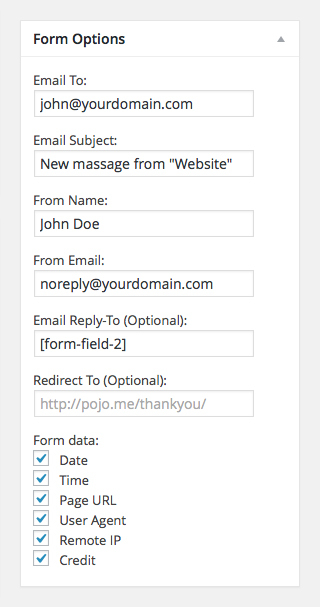 You can set for every form its custom title, while the default is set as: New Message from "Site Name", but you can combine it with the fields that the user is supposed to fill out. You can do this by using the Shortcode ID which is added to every field. With this field you can set the email address to automatically appear when the Reply button is clicked. This option is very useful, since by using the Shortcode ID which is added to every field you can set it as the sender's email. This way once you receive the email you can click on Reply and send the email back to the user, without needing to copy and paste. In this field you can add an URL to which the user will be redirected after sending the form. This is useful for when you need to track the amount of feedbacks that have been sent to you, or if you want to create a Target Goal in an analysis tool that you are using (Adwords, Facebook Pixel), you can embed them in the thank you page and thus track them easily. In every feedback that's sent to you, you can add data regarding the sender in order to easily track your users. 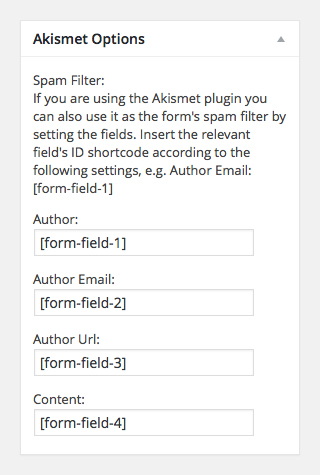 In order to deal with the amount of spam there is today, we've added an integration option of an Akismet spam filter which is installed in almost every WordPress site by entering the relevant fields. To make sure the filter will be effective, enter the relevant Shortcode ID from your form into every field, for example, in the email field insert the sender email's field Shortcode ID, this way the spam filter will check the email address. 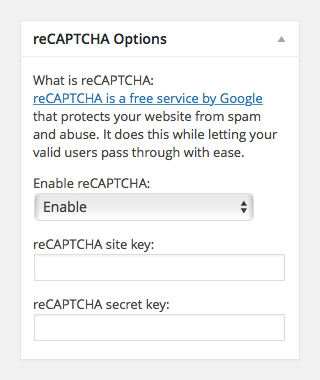 Integrate reCAPTCHA in the Pojo forms plugin, in order to protect your form from spam and abuse. reCAPTCHA is Google's free and popular spam protection service and is recommended to improve your site's security. To save all the feedbacks that are sent through the forms, you can install the Contact Form DB plugin and it will save all the feedbacks on the server's database, from which you can export the data as organized Excel or CSV files. This enables you to import the data to other systems, such as MailChimp etc'. To enable you to track the feedbacks that are sent in your forms, we've added the Activity Log plugin so you can be fully indicated as to whether the form was received and sent onward.